Marvelous Marlins Classic Slot Review - Casino Answers! 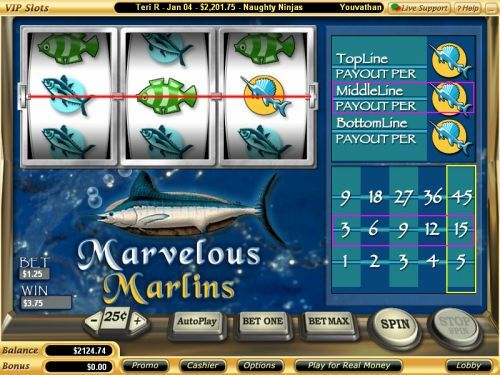 Marvelous Marlins is a 3-reel, 3-line classic slot machine developed by Vegas Technology. You can play the Marvelous Marlins classic slot machine at Bovada. Bets on the Marvelous Marlins slot machine are $0.01, $0.05, $0.10, $0.25, $0.50, $1, $2, $3, $4, $5, $6, $7, $8, $9 and $10 per line. All three paylines will be active on all spins on the Marvelous Marlins classic slot. You can play up to 5 coins by using the “Bet One” button. Play the 5-coin maximum bet by hitting the “Bet Max” button. You can bet anywhere from a penny per spin up to the maximum total bet of $50 per spin on the Marvelous Marlins penny slot. Players can manually stop their spins by using the “Stop Spin” button. To play the Marvelous Marlins classic slot, press the “Spin” button to spin the reels. The sole paying symbol on the Marvelous Marlins online slot machine is the Marlin symbol. On the top payline, one Marlin symbol anywhere on the line will pay out 45 coins. The Marlin symbol allows the player to win easily when playing at Bovada. There are 3 winning combinations on the Marvelous Marlins classic slot machine. The complete payout schedule is as follows (1/2/3/4/5 coin payouts in parenthesis): 1 Marlin symbol on bottom line (1/2/3/4/5), 1 Marlin symbol on center line (3/6/9/12/15) and 1 Marlin bottom on top line (9/18/27/36/45). Hit “Autoplay” to open up the Marvelous Marlins autoplay mode where you can select the number of spins (5, 10, 25, 50, 100, 250 or 500) and number of seconds between spins (1, 1.50 and 2). Stop settings include stop once all spins are complete, stop when jackpot is won, stop if a win exceeds or equals ($50, $100, $150, $200 or $250), stop on any win and stop if credits increase/decrease by ($50, $100, $150, $200 or $250). You can cancel autoplay on the Marvelous Marlins online slot at any time. The Marvelous Marlins classic slot machine has an interesting payout method that makes it worth a few spins. It’s also very cheap to play, so you aren’t risking much, although the rewards are low. You can try the Marvelous Marlins slot game out when you sign up and play at Bovada. Can players from the USA play the Marvelous Marlins online slot game for real money? Yes, American players are welcome to play the Marvelous Marlins classic slot game for real money at Vegas Tech online casinos such as Bovada. I hit 3 symbols on a payline in Marvelous Marlins. How come I didn’t win anything? The only symbol on Marvelous Marlins that pays out is the Marlin symbol. You only need one Marlin symbol to get a payout on the Marvelous Marlins slot machine.